No hotels at the archeological site of Lascaux, but the town of Montignac, just down the hill, has several, and nearby towns have more. Montignac , just down the hill 2 km (1-1/4 miles) from Lascaux II, is a pretty little town on the River Vézère with all the services for a comfortable stay, so you may decide to spend the night at one of its comfortable hotels. 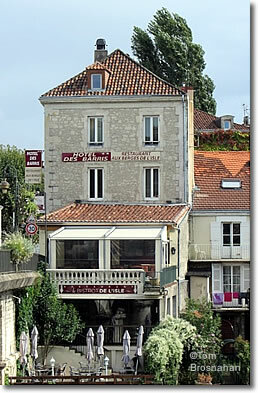 A small hotel overlooking the River Vézère in Montignac, near Lascaux II.